21 November 1885; 133 years ago (1885-11-21) as St. Mary's Y.M.A. Southampton Football Club (/saʊθˈ(h)æmptən/ ( listen)) is a professional association football club based in Southampton, Hampshire, England, which plays in the Premier League, the top tier of English football. Their home ground since 2001 has been St Mary's Stadium, before which they were based at The Dell. The club has been nicknamed "The Saints" since its inception in 1885 due to its history as a church football team, founded as St. Mary's Church of England Young Men's Association, and play in red and white shirts. Southampton has a long-standing rivalry with Portsmouth due to its close proximity and both cities' respective maritime history. Matches between the two sides are known as the South Coast derby. The club has won the FA Cup once, in 1976, and their highest-ever league finish was second in the First Division in 1983–84. Southampton were relegated from the Premier League on 15 May 2005, ending 27 successive seasons of top-division football for the club. They returned after a seven-year absence, and have played there ever since. Main article: History of Southampton F.C. Chart of yearly table positions of Southampton in the Football League. Southampton were originally founded at St. Mary's Church, on 21 November 1885 by members of the St. Mary's Church of England Young Men's Association. St. Mary's Y.M.A., as they were usually referred to in the local press, played most of their early games on The Common where games were frequently interrupted by pedestrians insistent on exercising their right to roam. More important matches, such as cup games, were played either at the County Cricket Ground in Northlands Road or the Antelope Cricket Ground in St Mary's Road. The club was originally known as St. Mary's Young Men's Association F.C. (usually abbreviated to "St. Mary's Y.M.A.") and then became simply St. Mary's F.C. in 1887–88, before adopting the name Southampton St. Mary's when the club joined the Southern League in 1894. For the start of their League career, Saints signed several new players on professional contracts, including Charles Baker, Alf Littlehales and Lachie Thomson from Stoke and Fred Hollands from Millwall. After winning the Southern League title in 1896–97, the club became a limited company and was renamed Southampton F.C. Southampton won the Southern League championship for three years running between 1897 and 1899 and again in 1901, 1903 and 1904. During this time, they moved to a newly built £10,000 stadium called The Dell, to the northwest of the city centre in 1898. Although they would spend the next 103 years there, the future was far from certain in those early days and the club had to rent the premises first before they could afford to buy the stadium in the early part of the 20th century. The club reached the first of their four FA Cup Finals in 1900. On that day, they went down 4–0 to Bury and two years later they would suffer a similar fate at the hands of Sheffield United as they were beaten 2–1 in a replay of the 1902 final. After World War I, Saints joined the newly formed Football League Third Division in 1920 which split into South and North sections a year later. The 1921–22 season ended in triumph with promotion and marked the beginning of a 31-year stay in the Second Division. The 1922–23 season was a unique "Even Season" – 14 wins, 14 draws and 14 defeats for a total of 42 points, or one point per game. Goals for and against statistics were also equal and the team finished in mid-table. In 1925 and 1927, they reached the semi-finals of the FA Cup, losing 2–0 and 2–1 to Sheffield United and Arsenal respectively. Saints were briefly forced to switch home matches to the ground of their local rivals Portsmouth at Fratton Park during World War II when a bomb landed on The Dell pitch in November 1940, leaving an 18-foot crater which damaged an underground culvert and flooded the pitch. Promotion was narrowly missed in 1947–48 when they finished in third place, a feat repeated the following season (despite having an eight-point lead with eight games to play) whilst in 1949–50 they were to be denied promotion by 0.06 of a goal, missing out on second place to Sheffield United. In the 1948–49 and 1949–50 seasons, Charlie Wayman rattled in a total of 56 goals. Then relegation in 1953 sent Saints sliding back into Division 3 (South). It took until 1960 for Saints to regain Second Division status with Derek Reeves plundering 39 of the champions' 106 league goals. On 27 April 1963 a crowd of 68,000 at Villa Park saw them lose 1–0 to Manchester United in the FA Cup semi-final. In 1966, when Ted Bates' team were promoted to the First Division as runners-up, with Martin Chivers scoring 30 of Saints' 85 league goals. For the following campaign Ron Davies arrived to score 43 goals in his first season. Saints stayed among the elite for eight years, with the highest finishing position being seventh place in 1968–69 and again in 1970–71. These finishes were high enough for them to qualify for the Inter-Cities Fairs Cup in 1969–70 (going out in Round 3 to Newcastle United) and its successor, the UEFA Cup in 1971–72, when they went out in the first round to Athletic Bilbao. In December 1973, Bates stood down to be replaced by his assistant Lawrie McMenemy. The Saints were one of the first victims of the new three-down relegation system in 1974. 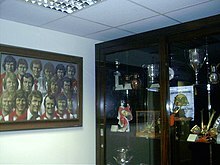 Under McMenemy's management, Saints started to rebuild in the Second Division, capturing players such as Peter Osgood, Jim McCalliog, Jim Steele and Peter Rodrigues (captain) and in 1976, Southampton reached the FA Cup Final, playing Manchester United at Wembley, and beat much-fancied United 1–0 with a goal from Bobby Stokes. The following season, they played in Europe again in the Cup Winners' Cup, reaching Round 3 where they lost 2–3 on aggregate to Anderlecht. In 1977–78, captained by Alan Ball, Saints finished runners-up in the Second Division (behind Bolton Wanderers) and returned to the First Division. They finished comfortably in 14th place in their first season back in the top flight. The following season they returned to Wembley in the final of the League Cup where they acquitted themselves well, losing 3–2 to Nottingham Forest. In 1980, McMenemy made his biggest signing, capturing the European Footballer of the Year Kevin Keegan. Although Keegan's Southampton career only lasted two years, Saints fielded an attractive side also containing Alan Ball, prolific goal-scorer Ted MacDougall, (who still holds the record for the largest number of goals in an FA Cup game – nine – for Bournemouth against Margate in an 11–0 win), MacDougall's strike partner at Bournemouth and Norwich City Phil Boyer, club stalwart Mick Channon and Charlie George and in 1980–81 they scored 76 goals, finishing in sixth place, then their highest league finish. The following season, Kevin Keegan helped lift the club to the top of the First Division. Southampton led the league for over two months, taking top spot on 30 January 1982 and staying there (apart from one week) until 3 April 1982. But in a disappointing end to the season, in which Keegan was hampered by a back injury, Southampton won only two of their last nine games and finished seventh. The winners of a wide-open title race were Keegan's old club Liverpool, who were crowned champions on the final day of the season. Keegan scored 26 of Southampton's 72 goals that season, but was then sold to Newcastle. Southampton continued to progress under McMenemy's stewardship, and with a team containing Peter Shilton (the England goalkeeper), Nick Holmes, David Armstrong, striker Steve Moran and quick winger Danny Wallace reached their highest ever league finish as runners-up in 1983–84 (three points behind the champions Liverpool) as well as reaching the semi-final of the FA Cup losing 1–0 to Everton at Highbury Stadium. McMenemy then added experienced midfielder Jimmy Case to his ranks. They finished fifth the following year, but as a result of the Heysel Disaster all English clubs were banned from European competition: had it not been for this, then Southampton would have again qualified for the UEFA Cup. McMenemy left at the end of the 1984–85 season to be succeeded by Chris Nicholl, who was sacked after six years in charge despite preserving the club's top flight status. He was replaced by Ian Branfoot, who until the end of the 1990–91 season had been assistant manager to Steve Coppell at Crystal Palace. By this stage, a key player in the Southampton line-up was Guernsey-born attacking midfielder/striker Matthew Le Tissier, who broke into the first team in the 1986–87 season. He was voted PFA Young Player of the Year in 1990 and later made eight appearances for the England team – he finally retired in 2002 at the age of 33. Another exciting young player to break into the Southampton team just after Le Tissier was Alan Shearer, who at the age of 17 scored a hat-trick against Arsenal in a league match in April 1988. Shearer was a first team regular by 1990, and stayed with Southampton until July 1992, when he was sold to Blackburn Rovers for a national record of more than £3 million. He then became the most expensive footballer in the world when Blackburn sold him to Newcastle for £15 million in 1996. He also scored 30 times for England internationally. Southampton were founding members of the Premier League in 1992–93, but spent most of the next ten seasons struggling against relegation. In 1995–96, Southampton finished 17th with 38 league points, avoiding relegation on goal difference. Two important wins during the final weeks of the season did much to ensure that Saints and not Manchester City would achieve Premiership survival. First came a 3–1 home win over eventual double winners Manchester United, then came a 1–0 away win over relegated Bolton Wanderers. Former Liverpool and Rangers manager Graeme Souness, was brought in, signing foreign players such as Egil Østenstad and Eyal Berkovic. The highlight of the season was a 6–3 win over Manchester United at The Dell in October, when both his signings scored twice. However, he had to deal with criticism over the Ali Dia debacle. He resigned after just one season in charge, being replaced by Dave Jones who had won promotion to Division One with Stockport County as well as reaching the League Cup semi-finals. In 1998–99, they were rooted to the bottom of the table for much of the first half of the season but again avoided relegation on the last day of the season after a late run of good results, helped by the intervention of Latvian Marian Pahars and old hero Le Tissier (The so-called "Great Escape"). 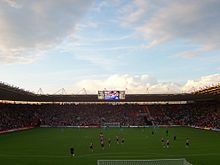 In 1999, Southampton were given the go-ahead to build a new 32,000-seat stadium in the St Mary's area of the city, having been playing in the Dell since 1898. The stadium had been converted to an all-seater format earlier in the decade, but had a capacity of less than 16,000 and was unsuitable for further expansion. During the 1999–2000 season, Dave Jones quit as Southampton manager to concentrate on a court case after he was accused of abusing children at the children's home where he had worked during the 1980s. The accusations were later proved to be groundless, but it was too late to save Jones' career as Southampton manager and he was succeeded by ex-England manager Glenn Hoddle. Hoddle helped keep Southampton well clear of the Premier League drop zone but having received an offer he moved to Tottenham Hotspur just before the end of the 2000–01 season. He was replaced by first-team coach Stuart Gray, who oversaw the relocation to the St Mary's Stadium for the 2001–02 season. At the end of the 2000–01 season, in the last competitive match at The Dell, Matthew Le Tissier came on late to score the last ever league goal at the old stadium with a half volley on the turn in a 3–2 win against Arsenal. Gray was sacked after a poor start to the following season, and he was replaced by ex-Coventry City manager Gordon Strachan, who steered Southampton to safety and a secure 11th-place finish. In 2002–03, Southampton finished eighth in the league and finished runners-up in the FA Cup to Arsenal (after losing 1–0 at the Millennium Stadium), thanks in no small part to the metamorphosis of James Beattie, who fired home 24 goals, 23 in the league. Strachan resigned in March 2004 and within eight months, two different managers – Paul Sturrock and Steve Wigley – had come and gone. Chairman Rupert Lowe risked the ire of Saints fans when he appointed Harry Redknapp as manager on 8 December 2004, just after his resignation at South Coast rivals Portsmouth. He brought in a number of new signings, including his son Jamie in the attempt to survive relegation. Southampton were relegated from the Premier League on the last day of the season, ending 27 successive seasons of top flight football for the club. Their relegation was ironically confirmed by a 2–1 home defeat to Manchester United, who had been on the receiving end of many upsets by Southampton over the years, namely in the 1976 FA Cup final and since then on a number of occasions in the league, as well as inflicting a heavy defeat on them in a November 1986 League Cup tie which cost United manager Ron Atkinson his job. Lowe and Southampton continued to make headlines after former England Rugby World Cup-winning coach Sir Clive Woodward joined the club—eventually being appointed technical director in June 2005. In November 2005, manager Harry Redknapp resigned to rejoin Portsmouth, and was replaced by George Burley. Rupert Lowe resigned as chairman in June 2006, and Jersey-based businessman Michael Wilde, who had become the club's major shareholder assumed the post. Following a club record £6 million being spent on transfers, Polish strikers Grzegorz Rasiak and Marek Saganowski performed well and the season saw the introduction of 17-year-old left back Gareth Bale. Southampton finished in sixth place and lost the play-off semi-final to Derby County on penalties. The board sought new investment in the club, and In February 2007 Wilde stepped down as chairman to be replaced by local businessman Leon Crouch as "Acting chairman", a role Crouch retained until 21 July 2007. In the 2007–08 season, George Burley revealed that players such as Bale and Kenwyne Jones had to be sold to stop the club going into administration and that failing to achieve promotion had put the club in serious financial difficulty. Burley left the club in January 2008 to take over as Scotland manager and was replaced by Nigel Pearson who saved the club from relegation on the final day. In July 2008 all the board members except one resigned, allowing Lowe and Wilde to return: Wilde as Chairman of Southampton FC and Rupert Lowe as Chairman of Southampton Leisure Holdings plc. Although Pearson kept the team up, the board did not renew his contract due to financial constraints, and the relatively unknown Dutchman Jan Poortvliet was appointed manager. Financial troubles continued to mount, resulting in more players being sold or loaned out and parts of St Mary's were closed off to reduce costs. In January 2009, Poortvliet resigned with the club one place from bottom of the Championship, with Mark Wotte taking over managerial duties. In April 2009, Southampton's parent company was placed in administration. A ten-point penalty was imposed, but as the team was already being relegated due to finishing second from bottom of the Football League Championship this points deduction had to apply to the 2009–10 season. By the end of May, the club was unable to meet its staff wages and asked employees to work unpaid as a gesture of goodwill. The administrator warned that the club faced imminent bankruptcy unless a buyer was found. In June, administrator Mark Fry confirmed negotiations with two groups of investors, followed by confirmation that the club had been sold to an overseas buyer "owned and controlled by Markus Liebherr". Liebherr brought in Italian businessman Nicola Cortese to look after the club's business interests on his behalf. In July 2009, with the club in the control of the new owner, Wotte was sacked as head coach and Alan Pardew was appointed as the new First Team Manager. The Saints made their first big signing under Liebherr, striker Rickie Lambert, who was purchased on 10 August from League One side Bristol Rovers. Southampton started the 2009–10 season in League One, in the third tier of English football for the first time in 50 years and with −10 points. In March 2010, Southampton won their first trophy since 1976 when they defeated Carlisle United 4–1 at Wembley to claim the Football League Trophy. Southampton finished the season in 7th place, seven points from the last play-off position. A new home shirt was unveiled on 10 June 2010, in celebration of the club's 125th anniversary. The design was based on the original St. Mary's Y.M.A. kit used in 1885; it featured the new anniversary crest and was without a sponsor's logo. On 11 August, it was announced that Liebherr had died; however, the club's future had been assured and planned for before his death. Pardew was dismissed in August and Nigel Adkins joined from Scunthorpe United as his replacement. The club was promoted to the Championship in May 2011 as runners-up to Brighton & Hove Albion. 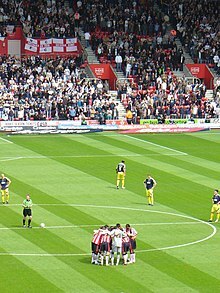 Returning to the Championship for the 2011–12 season, Southampton made their best start to a season for 75 years with a winning run at St. Mary's of 13 league games, setting a new club record and going top of the league. In April 2012, Southampton achieved promotion to the Premier League as runners-up to Reading. 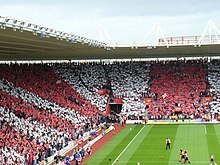 The final game of the season game set a record attendance at St Mary's Stadium of 32,363. Lambert finished the season as the Championship's top goalscorer with 27 league goals, his third "Golden Boot" in four seasons. He also won the Championship Player of the Year award. Southampton returned to the Premier league for season 2012–13 initially under Nigel Adkins. Substantial sums were spent to strengthen the playing squad, but early in the season, Adkins was replaced by Argentine coach Mauricio Pochettino. Southampton finished the season in 14th place, and next season in 8th. At the end of the 2013–14 season, Pochettino departed the club for Tottenham. The club subsequently appointed Ronald Koeman as his replacement on a three-year contract, and made several high-profile sales over the summer. In the final game of the 2014–15 season, a 6–1 victory against Aston Villa, Sadio Mané scored three goals in the space of 176 seconds, the fastest hat-trick in the history of the Premier League. The club finished seventh, then their highest ever Premier League rank, therefore qualifying for the 2015–16 UEFA Europa League. After defeating Vitesse, the Saints were eliminated in the play-off by Midtjylland. The following season, Southampton once again set new records for the club at the end of the season, finishing in sixth place. They once again qualified for the Europa League, although this time immediately entered the group stages, as opposed to the play-off rounds. For recent transfers, see 2018–19 Southampton F.C. season § Transfers. Southampton runs a highly successful youth academy, with a number of teams from ages nine to 18 years. Recent products of the club's youth system include England internationals Adam Lallana, Theo Walcott, Alex Oxlade-Chamberlain, Wayne Bridge and Luke Shaw; Wales winger Gareth Bale; and Northern Ireland defender Chris Baird. Spent: Guido Carrillo, £19.2 million fee paid to AS Monaco. St Mary's Stadium has been home to the Saints since August 2001. It has a capacity of 32,689 and is one of only a handful of stadia in Europe to meet UEFA's Four Star criteria. The stadium has also been host to a number of international games. The ground's record attendance is 32,363, set in a game between Southampton and Coventry City in April 2012. From 1898 to 2001, Southampton played their home games at The Dell. The purpose-built stadium was redeveloped a number of times through its 103-year history, with two of the stands being completely rebuilt after fires and in 1950 it became the first ground in England to have permanent floodlighting installed. Following the Taylor report, The Dell was converted to an all-seater stadium and, with a capacity of approximately 15,000, became the smallest ground in England's top-flight, precipitating a move to a new home. Prior to The Dell, the club's home grounds were the Antelope Ground, from 1887 to 1896, and the County Cricket Ground, from 1896 to 1898. The club's training facilities, Staplewood Campus, are located in Marchwood on the edge of the New Forest. The current facilities were opened in November 2014, at a cost of almost £40m. The main building was named after the club's late owner, Markus Liebherr. For the 2012–13 season, and for the foreseeable future, the club agreed a deal with Eastleigh F.C., currently of the Conference South, for the use of their stadium, Ten Acres, for The Saints' U21 team fixtures. This continues a partnership with Eastleigh that has lasted for the last decade. The Saints' anthem is the popular sports tune When the Saints Go Marching In, and since the club's official nickname is "the Saints", they are one of only a few teams who do not change the original lyric. Originally, the club used the same crest as the one used by the city itself. However, during the 1970s a competition was run for fans to design a new one. The winning design, designed by Rolland Parris, was used for around 20 years, before being modified slightly by Southampton design agency The Graphics Workshop in the 1990s for copyright reasons. From top-to-bottom, the halo is a reference to the nickname "Saints", the ball to the nature of the club, the scarf to the fans and the team colours. The tree represents the nearby New Forest and Southampton Common, with the water representing Southampton's connections with the rivers, seas and oceans. Below that is a white rose – the symbol of the city which is also present on the city crest. In the mid-1990s the ball was changed from a vintage style ball (such as those used in the 1960s) to the current ball with black and white panels, for copyright reasons. On 13 May 2010, the official crest for the 125th anniversary was released: "The black outline and halo feature will now appear in gold, whilst the all important years 1885 and 2010 are scripted either side of the shield, with the figure 125 replacing the ball". The badge was used on Southampton's shirts for the 2010–11 season. The South Coast Derby is the name given to matches between the Saints and their fierce nearby rivals, Portsmouth F.C., from the city of the same name, just over 18 miles from Southampton. The matches are also referred to as the Hampshire Derby. Including Southern League games, there have been 70 games between the two clubs, with Southampton winning 34 and Portsmouth 21. Ten companies have sponsored the players' shirts since shirt advertising was permitted in English football. The first company to do so was photocopier manufacturer Rank Xerox who sponsored the club for three years from 1980. Other sponsors have been Air Florida (1983), Draper Tools (1984–93), Dimplex (1993–95), Sanderson (1995–99), Friends Provident (1999–2006), Flybe.com (2006–10), aap3 (2011–14), and Veho (2014–16). Since 2016 the shirt sponsor has been Virgin Media. Since 2016 Sounthamptons kits have been manufactured by Under Armour. Previous manufacturers have included Umbro (1974–76, 2008–13), Admiral (1976–80, 1991–93), Patrick (1980–87), Pony (1993–99), and Adidas (2013–14, 2015–16). From 1999–2008 and in 2014–15 they used their own brand, Saints. ^ "Premier League Handbook 2018–19". Premier League. 30 July 2018. Retrieved 3 January 2019. ^ a b Struthers, Greg. "Caught in Time: Southampton finish runners-up in the First Division, 1984". The Times. London. Retrieved 4 January 2009. ^ a b "Southampton 1 – 2 Man Utd". BBC Sport. 15 May 2005. Retrieved 19 August 2013. ^ Chalk, Gary; Holley, Duncan (1987). Saints – A complete record. Breedon Books. pp. 16–17. ISBN 0-907969-22-4. ^ "Saints name Redknapp as boss". BBC Sport. BBC. 8 December 2004. Retrieved 30 October 2013. ^ "Southampton confirm Woodward move". BBC Sport. BBC. 22 June 2005. Retrieved 30 October 2013. ^ "Poortvliet resigns as Saints boss". BBC Sport. 23 January 2009. Retrieved 30 October 2013. ^ "Chairman's statement". Saintsfc.co.uk. 24 January 2009. Archived from the original on 17 February 2009. Retrieved 30 October 2013. ^ "Chairman speaks about Jan's departure". Daily Echo. 24 January 2009. Retrieved 30 October 2013. ^ "Southampton crisis deepens as club fails to pay wages this month". Daily Mail. London. 28 May 2009. Retrieved 28 May 2009. ^ "Swiss Saints deal completed". Southern Daily Echo. 8 July 2009. Retrieved 27 February 2010. ^ "Southampton appoint Alan Pardew as new manager". The Daily Telegraph. 17 July 2009. Retrieved 19 August 2013. ^ "Bristol Rovers striker Rickie Lambert seals £1m move to Southampton". Bristol Post. 10 August 2009. Archived from the original on 21 October 2014. Retrieved 30 October 2013. ^ Shemilt, Stephan (28 March 2010). "Carlisle 1 – 4 Southampton". BBC Sport. Retrieved 29 March 2010. ^ Dan Kerins (June 2010). "Southampton return to roots with new home kit". Southern Daily Echo. Newsquest Media Group. Retrieved 18 June 2010. ^ "Markus Liebherr of Southampton Football Club". Southampton FC. 13 August 2010. Archived from the original on 16 June 2012. Retrieved 30 October 2013. ^ "Club Statement: Club owner back's Chairman's ambitious plans". Southampton F.C. 18 May 2013. Retrieved 18 May 2013. ^ "New First Team Manager Appointed". Southampton FC. 12 September 2010. Archived from the original on 17 March 2012. Retrieved 30 October 2013. ^ "New First Team Manager Appointed". Southampton F.C. 18 January 2013. Retrieved 18 January 2013. ^ "Adkins sacked as Southampton boss". BBC Sport. 18 January 2013. Retrieved 18 January 2013. ^ Smith, Ben (2 June 2014). "Rickie Lambert completes transfer to Liverpool from Southampton". BBC Sport. Retrieved 2 June 2014. ^ "Adam Lallana: Liverpool sign Southampton captain for £25m". BBC Sport. 1 July 2014. Retrieved 1 July 2014. ^ "Liverpool sign Dejan Lovren from Southampton for £20m". BBC Sport. 27 July 2014. Retrieved 27 July 2014. ^ "Luke Shaw: Man Utd sign Southampton defender for £27m". BBC Sport. 27 June 2014. Retrieved 27 June 2014. ^ "Calum Chambers: Arsenal complete £16m signing of Southampton defender". BBC Sport. 28 July 2014. Retrieved 28 July 2014. ^ "Sadio Mane: Southampton winger's hat-trick is 'best moment'". BBC Sport. ^ Reddy, Luke. "Southampton 8–0 Sunderland". BBC Sport. ^ a b "Barclays Premier League table, current & previous standings". premierleague.com. ^ "Europa League qualification explained: How Liverpool, Tottenham and Southampton can see their party ruined by Aston Villa". Daily Mail. ^ "UEFA Europa League – Southampton". UEFA.com. ^ Brown, Luke (27 December 2017). "Liverpool to sign Virgil van Dijk from Southampton in world-record £75m January transfer". The Independent. Retrieved 5 January 2018. ^ "Southampton sack manager Mauricio Pellegrino". Sky Sports. Retrieved 12 March 2018. ^ "Mauricio Pellegrino: Southampton sack manager with eight games left of season". BBC Sport. 12 March 2018. Retrieved 12 March 2018. ^ "Southampton 0–1 Manchester City". BBC Sport. 13 May 2018. Retrieved 1 June 2018. ^ "Swansea City 1–2 Stoke City". BBC Sport. 13 May 2018. Retrieved 1 June 2018. ^ "Swansea City 0–1 Southampton". BBC Sport. 8 May 2018. Retrieved 1 June 2018. ^ "Mark Hughes: Southampton sack manager after eight months in charge". BBC Sport. 3 December 2018. Retrieved 3 December 2018. ^ "Ralph Hasenhuttl: Southampton name former RB Leipzig boss as new manager". BBC Sport. 5 December 2018. Retrieved 5 December 2018. ^ "First team". Southampton F.C. ^ "Big-5 Weekly Post (Most profitable youth academies)" (PDF). www.football-observatory.com. CIES Football Observatory. 10 March 2015. Retrieved 18 December 2016. ^ "Southampton have Europe's most profitable youth academy - where do Barcelona, Madrid and Chelsea rank? - Goal.com". 13 March 2015. Retrieved 18 December 2016 – via Goal.com. ^ a b c d e f g "Club Records". Southampton FC. Retrieved 30 October 2013. ^ Bull, David; Brunskell, Bob (2000). Match of the Millennium. Hagiology Publishing. pp. 26–27. ISBN 0-9534474-1-3. ^ "Virgil van Dijk: Liverpool to sign Southampton defender for world record £75m". BBC News. 27 December 2017. Retrieved 25 January 2018. ^ "Staff Profiles". Southampton FC. Retrieved 1 August 2013. ^ "St Mary's Stadium". Club profile: Southampton. The Premier League. Retrieved 21 July 2013. ^ "Around the grounds: St Mary's Stadium". Premier League. 15 July 2013. Retrieved 30 October 2013. ^ "Club Records". www.saintsfc.com. Southampton F.C. Retrieved 16 February 2016. ^ Chalk, Gary; Holley, Duncan (1987). Saints – A complete record. Breedon Books. pp. 216–220. ISBN 0-907969-22-4. ^ "Saints honour Markus Liebherr's memory at new training centre". saintsfc.co.uk. ^ "Saints & Spitfires Link Up". Southampton FC. 27 November 2012. Retrieved 19 August 2013. ^ "The arms of the city of Southampton". Southampton City Council. Archived from the original on 28 February 2010. Retrieved 30 November 2009. ^ "125 Anniversary Crest Unveiled". Southampton FC. 18 May 2010. Archived from the original on 5 April 2012. Retrieved 30 October 2013. ^ "Veho announced as new Main Club sponsor". Saints FC. Southampton Football Club Official Website. Retrieved 27 May 2015. ^ "Virgin Media become Southampton's main club sponsor". Southampton FC. 8 June 2016. Retrieved 8 June 2016. ^ Chalk, Gary; Holley, Duncan (1987). Saints – A complete record. Breedon Books. p. 312. ISBN 0-907969-22-4. ^ "Southampton 8 – 0 Sunderland". BBC Sport. 18 October 2014. Retrieved 18 October 2014. Wikimedia Commons has media related to Southampton F.C..
Southampton Saints Girls & Ladies F.C. This page was last edited on 20 April 2019, at 13:04 (UTC).